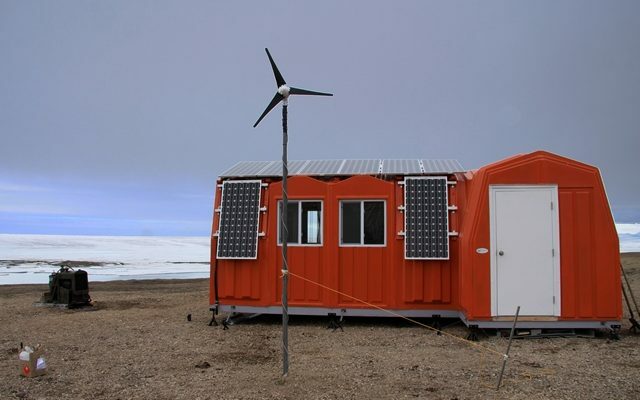 The Ward Hunt Island Observatory research station is owned and run by the Centre d’études Nordiques (CEN: Centre for Northern Studies) in collaboration with Parks Canada (http://www.pc.gc.ca/index.aspx). Ward Hunt Island is located at the northernmost tip of Canada, off the coast of northern Ellesmere Island and is part of Quttinirpaaq National Park, Nunavut, Canada (83°06’ N, 74°10’ W). Quttinirpaaq means “top of the world” in Inuktitut and reflects this station’s location, situated about 750 km from the North Pole. This island in the high arcticDefinitions of the Arctic vary according to environmental, geographical, political, cultural and scientific perspectives. Some scientists define the Arctic as areas having a high latitude, long winters, short, cool summers,... More is 6.5 km long (from east to west) and 3.3 km wide. The climateThe average weather we would expect over a long period of time (seasons, years, decades). Climate varies from place-to-place across the Earth. Climate is determined by long-term (over at least... More regime is typical of polar deserts, with dry and extremely cold temperatures (annual mean temperature of -17.3°C). The natural environment features lakes, ice shelves, fjords, epishelf lakes, ice caps and glaciers, sea ice, mountains, and valleys. The desert terrain has a low plant and animal diversity, but the region contains diverse microbial communities such as cyanobacterial mats that survive in these extreme environments. An overview of past studies in this region is given in: Vincent, W.F., et al. 2011: Extreme ecosystems and geosystems in the Canadian High Arctic: Ward Hunt Island and vicinity (Ecoscience 18: 236-261). The first known sighting was in 1876 by Pelham Aldrich, a lieutenant with the George Nares expedition, and named for George Ward Hunt, First Lord of the Admiralty (1874-1877). Ward Hunt Island was briefly used as a weather station during the International Geophysical Year of 1957-58, and since then it has been used as the starting point for a number of attempts to reach the North Pole, beginning with Ralph Plaisted in 1968. Scientists have been working at the station since the 1950s. Parks Canada has three Weatherhaven shelters with oil burner furnaces, each can host 12 people for sleeping. CEN operates three automated, year-round climate stations of SILA Network in the region. A laboratory made of insulated fiberglass and powered by solar panels was built in 2010 thanks to a federal infrastructure grant. Main research fields comprise the structure and functioning of lake and river ecosystems at high latitudes, dynamics of northern ice shelves, microbial ecology, geomorphology of polar desert landscapes, impacts of UV radiation, and Climate Change on aquatic ecosystems. Extensive climate data records are available upon request: www.cen.ulaval.ca/nordicanad. For requests concerning ecological monitoring data, please contact the leading researcher, Warwick Vincent (warwick.vincent@bio.ulaval.ca). No communities live on Ward Hunt Island. The nearest community is Grise Fjord, located 800 km away on southern Ellesmere Island. Grise Fjord, (Inuktitut: Aujuittuq, “place that never thaws”; Inuktitut syllabics: ᐊᐅᔪᐃᑦᑐᖅ) is a small Inuit hamlet in the Qikiqtaaluk Region in the territory of Nunavut, Canada. With a population of 141 residents (as of the Canada 2006 Census), it is the only Inuit community on Ellesmere Island. It is also one of the coldest inhabited places in the world, with an average yearly temperature of -16.5°C. Grise Fjord lies 1160 km north of the Arctic CircleA line of latitude currently at 66° 33′ 44″ (66.5622°) north of the Equator. It is the southern limit of the region of the Earth that experiences the 'midnight sun'.... More in the Arctic Cordillera mountain range which is the only major mountain system east of the Canadian Rockies. The Canadian military base Alert is 170 km to the East and slightly to the South of Ward Hunt Island. Given that this is an extremely isolated station in a national park, all research activities must be planned and proposed at least one year in advance. Contact CEN for more information (cen@cen. ulaval.ca). For information on access and permits, contact Quttinirpaaq Park Manager (http://www.pc.gc.ca/pn-np/nu/quttinirpaaq/ plan.aspx) and the Polar Continental Shelf Project (PCSP) for appropriate application forms to access the site via chartered flights (http://polar.nrcan.gc.ca/).